Combat is something that all of us face, typically every day. Very rarely are we forced into mortal combat (other than in video games), but we go to combat on any number of different levels. Any time we compete, in a game, for a job, for status among our peers, even for that last cookie in the box, we engage in some form of combat, however small. The Principles of Combat are valid in all forms of combat. As such, they are extremely valuable to all of us. Indeed, one could accurately say that they are vital. Knowing and practicing the principles of combat is somewhat like having the cheat codes in a video game. They allow the user to operate at a different level and with vastly superior tools to almost all opponents. To be clear, principles are not techniques. They do not say how to respond to this situation or that one. Principles take it one level deeper. They explain what makes a particular technique more or less effective than another. 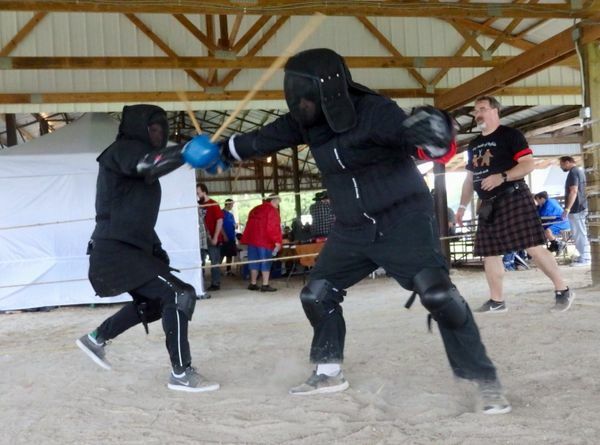 They are the underlying foundations upon which sword fighting techniques—and other life skills—can be based. They allow the student to assess existing techniques or design new ones effectively and scientifically. This may seem like a very basic principle, but it is one of the most frequently ignored, and potentially the most important of them all. In most combat situations, the problem is plain and simple: the opponent. Whether that’s across a boardroom table or on a wrestling mat, face the opponent. Face him or her with the whole body. If part of the body is turned away, it not only appears as weakness on a very primal level, but the fighter is not fully engaged in the confrontation, and thus, is less able to act. This is the simple question of who moves first in an attack. In the 1400’s, the Sun still moved around the Earth (science changed it later), so Fiore’s directive was to be the Earth. Wait for the opponent to commit, and then react quickly and decisively. Let them be the Sun. 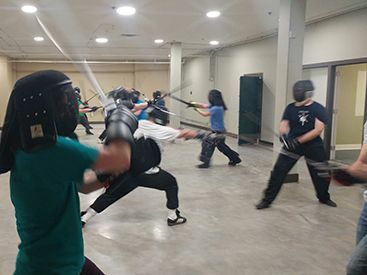 It may seem counterintuitive to not grab the initiative in an attack, but experience has shown time and again that a parry and counterattack is a significantly more effective fighting technique. This refers to the head (Skull) and the four bones (Crossbones) attached directly to the torso, namely the thigh bones and upper arm bones. It also includes the torso, but it doesn’t flow nearly so well when you say “Skull and Crossbones and Torso,” so we bow to poetic license. In swordplay, the extremities will wound an opponent, and often take them out of the fight, but you really need the skull and crossbones to deliver a fatal blow. This refers to two hands on top. Two hands on top of the opponent, whether on one arm or either shoulder, or on the head, allow one to push down and dominate the opponent with far greater power. Two on top allows one to bring the whole body mass into the equation rather than simply the strength of the upper arms. When attacking an opponent, the angle of a strike determines much of its power. Coming straight down, or straight in from the side is the slowest and weakest angle. The closer the angle is to a 45 degree cut, the stronger and quicker the attack becomes, thus making it harder to parry. Spiral is a three-dimensional extension of the 45 degrees principle, and possibly the most powerful of all the principles. A Spiral is a circle moving in two directions at the same time, down and in towards the center. This is an extremely elegant picture visually, and it brings to bear so many of the physical strengths of the human body. In grappling, spinning the opponent down and in towards the body is a fighting technique that provides tremendous momentum and power. Our final Principle of Combat deals with the two main lines of force, and the corollary principles that they affect. This principle comes full circle in that it is an extension of the first principle, Face Your Problem. The advantage of having two legs comes at a severe penalty in balance. Lines of Force use this disadvantage to gain the advantage over the opponent. 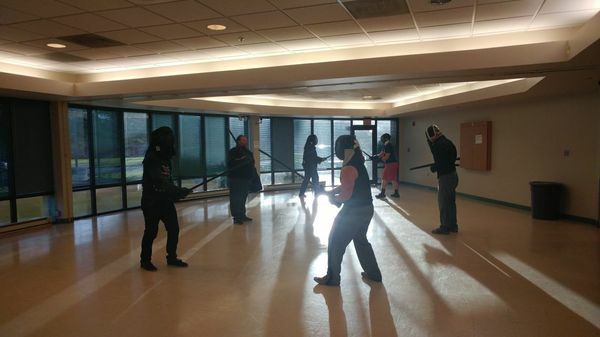 Rediscover your passion through the sword fighting class of your choice at Kansas City’s premier sword combat studio. 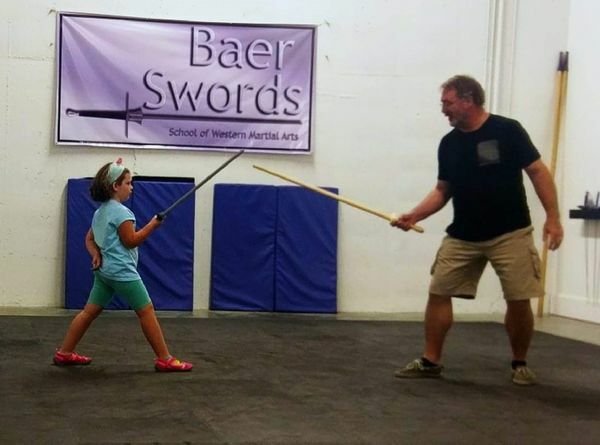 We promise hands-on instruction, expert support and more fun than you can shake a sword at.